I couldn’t make it up to Inwood this week, but the MTA and local pols cut the ribbon on the rehabbed Dyckman Street station. After two years, $31 million and one lawsuit, the station, its new mezzanine and downtown-bound elevator opened. There’s also a new Arts for Transit installation at the station which finds itself on the National Register of Historic Places. 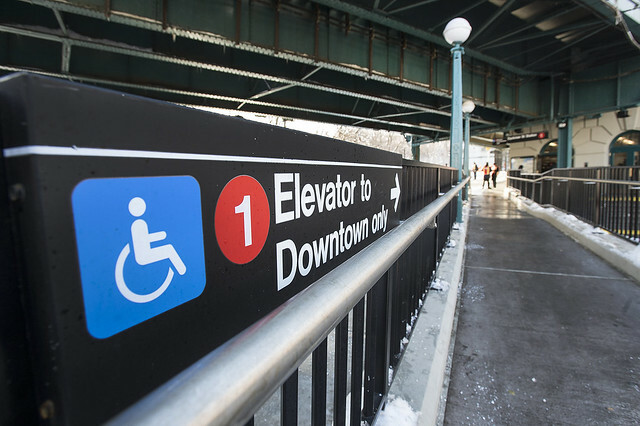 In conjunction with the rehab, Jim Dwyer penned a The Times column about the impact of the elevator on accessibility. It’s certainly worth a read as it provides a glimpse inside the travels of those who cannot easily get around. MTA officials, meanwhile, praised the spruced-up station. “We have been able to fully rehabilitate this historic station improving the structural aspects and customer amenities while retaining the unique architectural features that have made this station so visually special,” NYC Transit President Carmen Bianco said. Outside of the good news in Inwood, there’s a light slate of work this weekend. Let’s dive in. From 3:45 a.m. Saturday, February 8 to 10:00 p.m. Sunday, February 9, 2 trains operate in two sections due to track panel installation work north of Nereid Av. Between E 180 St and 241 St. To continue your trip, transfer at E 180 St.
From 3:45 a.m. Saturday, February 8 to 10:00 p.m. Sunday, February 9, 2 trains run express from Wakefield 241 St to Gun Hill Rd due to track panel installation. From 3:45 a.m. to 6:00 a.m. Saturday, February 8 and from 11:00 p.m. to 8:00 a.m. Saturday, February 8, to Sunday, February 9, 5 shuttle trains are suspended between Eastchester-Dyre Av and E180 St due to track panel installation work at Nereid Av. 5 Shuttle service is replaced by 2 trains between Eastchester-Dyre Av and E 180 St.
From 11:30 p.m. Friday, February 7 to 5:00 a.m. Monday, February 10, A trains run on the F line between Jay Street-MetroTech and W4 St due to emergency Verizon cable replacement in the Cranberry tunnel. From 11:30 p.m. Friday, February 7 to 5:00 a.m. Monday, February 10, A trains are suspended between Jay St-MetroTech and Utica Av in both directions due to track tie renewal north of Hoyt-Schermerhorn. Transfer between A trains and free shuttle buses. From 11:15 p.m. Friday, February 7 to 5:00 a.m. Monday, February 10, C trains are suspended between Chambers St and Euclid Av in both directions due to track tie renewal north of Hoyt-Schermerhorn, and emergency Verizon cable replacement in the Cranberry tunnel. Uptown C trains run express from Canal Street to 59 St Columbus Circle. From 11:45 p.m. Friday, February 7, to 6:30 a.m. Sunday, February 9, and from 11:45 p.m. Sunday, February 9, to 5:00 a.m. Monday, February 10, Manhattan-bound E trains run express from 71 Av to Queens Plaza due to track maintenance at 46 St and 36 St.
From 11:45 p.m. Friday, February 7, to 5:00 a.m. Monday, February 10, Manhattan-bound E trains skip Van Wyck Blvd and 75 Ave due to signal modernization at Forest Hills-71st Avenue and Kew Gardens-Union Turnpike. From 11:45 p.m. Friday, February 7 to 5:00 a.m. and Monday, February 10, Coney Island-bound F trains skip 4 Av-9 St, 15 St-Prospect Park, and Fort Hamilton Pkwy due to signal work at Church Av. For service to these stations take a Coney Island-bound F train to 7 Av or Church Av and transfer to a Queens-bound F or G train. From these stations, take a Queens-bound F or G to 7 Av or Smith-9 Sts and transfer to a Coney Island-bound F.
From 11:45 p.m. Friday, February 7 to 5:00 a.m. and Monday, February 10, Coney Island-bound F trains skip Sutphin Blvd, Van Wyck Blvd and 75 Av due to signal cable installation. From 11:45 p.m. Friday, February 7 to 5:00 a.m. and Monday, February 10, Church Av-bound G trains skip 4 Av-9 St, 15 St-Prospect Park, and Fort Hamilton Pkwy due to signal work at Church Av. From 6:00 a.m. to 11:00 p.m. Saturday, February 8, and Sunday, February 9, Bay Ridge-bound R trains run express from 71 Av to Queens Plaza due to track maintenance work at 46 St and 36 St.
Renderings show dramatically wider concourses and a reimagined Grand Central as part of the Midtown East rezoning. According to the Department of City Planning, the rezoning is realistically expected to yield 3.8 million square feet, net, of new office space — enough room for, the department estimates, 15,000 more office workers. Contrary to some press coverage, the rezoning will actually be relatively small. For comparison’s sake, around 25 million square feet of new offices alone, with millions more in housing and hotels, are zoned to rise at Hudson Yards. Short of rebuilding the Third Avenue el or finishing the Second Avenue subway, it’s hard to imagine what other transportation improvements critics could want out of the rezoning. There may be other reasons for opposition, but anyone who takes a cursory look at the infrastructure under construction in the neighborhood can’t help but conclude that it’s slated for way more extra capacity than 15,000 office workers could ever fill. Simply put, transit is not an issue. There are certainly discrete areas where transit is an issue. Without the rezoning, East Side Access won’t connect directly to the subway. But East Side Access itself won’t impact the subways because the vast majority of riders coming from Long Island won’t need a subway connection. Rather, the issues focus around Grand Central’s passenger flow. Crowding on the subway platforms may reach critical conditions without upgrades, but it’s already a situation that should be addressed, as I wrote this week, Midtown East rezoning or not. There are plenty of legitimate reasons to put a temporary halt on Midtown East rezoning if the major players feel it is appropriate, but Mayor-elect Bill de Blasio Dan Garodnik, the area’s councilman, have both vowed to move it forward. Any opponents who cite transit as an issue though are using something that isn’t a true overarching problem as a crutch. When the MTA rehabilitated the Columbus Circle complex at 59th St., the project, like many others, was delayed and overbudget. By the time the rehab wrapped in 2010, there was no formal ribbon cutting or acknowledgment of the project’s end. It was just done, and the MTA had a shiny new station at its disposal. With the new station came a new retail opportunity. The corridor underneath 8th Ave. contains approximately 11,500 square feet of retail space outside of fare control, and the 13 stores gave the MTA an opportunity to show that they can encourage high-quality retail. Yet, since open the station, the only thing that’s happened was an RFP issued in mid-2012. Now after fits and starts, the MTA is set to award a master lease to the space to a group headed, in part, by a former MTA real estate executive. 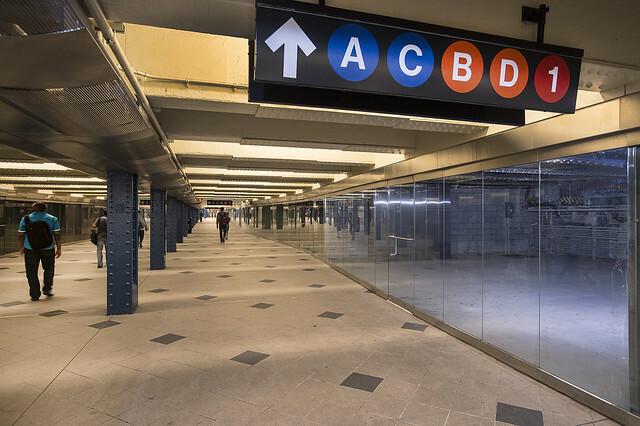 In materials distributed to the Board’s Finance Committee this week, the MTA has unveiled that an entity called Drop By at Columbus Circle has won the bidding to take over the maser lease for the space. The lease will run for 20 years with a 10-year option held by Drop By, and rent payments with start at over $700,000 a year with Drop By owning, by year three, 20 percent of operating income over $2.775 million. The breakpoint will increase periodically over the term of the lease, and Drop By will have the ability to sell digital advertising in the space once the MTA’s current deal with CBS Outdoors expires. So who won? Drop By is a joint venture between Susan Fine, the former MTA Director of Real Estate who was responsible for the retail revitalization at Grand Central, and 40 North Properties, an investment company held by Howard Glatzer. The MTA doesn’t explicitly address the appearance of a conflict of interests in award Fine’s group the lease but notes that Drop By’s bid offered the highest guaranteed base rent. She has also worked in the private sector for a while since leaving the MTA. With the lease situation cleared up, the MTA has high expectations for the space. According to the Board materials, the MTA expects “retail uses of the level of quality generally prevailing at other high quality shopping malls associated with transportation facilities in New York City, such as, by way of example, the below-grade retail concourses at Rockefeller Center and the up-to-date terminals at the New York area’s major airports.” The MTA also expects Drop By to fulfill the promises of its RFP as it installs air conditioning in the circulating space and corridor underneath 8th Ave. in the station complex. It’s interesting that the MTA’s points of comparison here are airports and Rockefeller Center but not Grand Central. It seems a more modest goal for Columbus Circle. Still, it’s clear that Drop By, between the long-term commitments and promised capital upgrades, has higher goals in mind. And those goals matter because the MTA is undergoing a similar process with a more important piece of real estate in Lower Manhattan. As the Columbus Circle RFP process took a little bit longer to resolve than the agency would have hoped, the Fulton St. Transit Center is set to open to the public in June. It won’t be fully completed by then, and it’s unlikely that any of the retail spaces will be in use. But the MTA wants a similar master lease executed with one entity responsible for filling the spaces there. Think, then, of Columbus Circle as a test run. If the MTA can find a tenant here willing to invest in an underground space, it may be even easier to convince potential investors to look at the Fulton St. Transit Center as a bigger and more visible opportunity. As part of its Next New York series, the Forum for Urban Design has been posting a variety of project proposals on a new website. For the dreamers among us, these visuals are a rabbit hole of urban delight. Head down the path to find a world in which the Triboro RX exists or another with a one-seat ride to La Guardia Airport. Many of the transit plans are ideas I’ve explored in depth in the past, but here’s a new one: a Midtown-Queens Tramway. Put forward by Claire Weisz, Mark Yoes and Jacob Dugopolski from WXY Architecture + Urban Design, the idea is a simple one: Extend the Roosevelt Island tram west to Central Park and east to Queens Plaza. The designers call this a “new uninterrupted connections across the river, linking major destinations across the five boroughs.” Though it’s tough to see how this tramway improves upon the preexisting two-stop subway connection via the R train between Queens Plaza and Central Park, it’s certainly intriguing to see a direct tram connection between Roosevelt Island and Queens. First, we could extend the Roosevelt Island tram in both directions, creating a new link from Queens Plaza to Central Park. The tram could be a high-visibility attraction, steering tourists from Central Park to the museums and galleries of Long Island City. And it would serve commuters as an above-grade transit option with a fantastic view that links Queens Plaza with Midtown Manhattan or the new Roosevelt Island campus and innovation hub. The East River Ferry could also be expanded to bridge neighborhoods directly across the river from one another. Paired with new bikeways and express bus routes along the waterfront, the ferry would offer a quicker transportation alternative to existing multi-stop bus and subway routes. The ferry should create new access points at Roosevelt Island; Pier 35, Houston Street, and Stuyvesant Cove in Manhattan; and Jay Street and the Brooklyn Navy Yard in Brooklyn. Finally, we could invest in new bridges to unite our waterfront greenways. We could link Governors Island to Red Hook, Greenpoint and Long Island City along Manhattan Avenue, Harlem and Yankee Stadium along W. 153rd Street, Hunts Point and Soundview along Lafayette Avenue, and Gowanus and Red Hook along Centre Street. Unless Weisz and her co-designers are using high speed ferries on a rather narrow waterway, the boats won’t offer up “quicker transportation” than existing subway routes, but these boats, as the success of the East River ferries has shown, can connect waterfront neighborhoods that may not have easy subway or bus access. While exiting the Times Square station near the Shuttle platform’s Track 4 exit today, I noticed the sign you see at the top of the post. For Manhattan bus riders, a big day is coming soon as the MTA has promised that BusTime, it’s real-time bus tracking system, will be available on all of the borough’s buses some time this month. I reached out to the MTA for more details and was told that the announcement will come next week. BusTime is the MTA’s distance-based bus location system that was developed in-house. While the system does not include countdown clocks, it comes with a text message-based system and smartphone enabled apps as well. For Manhattan bus riders, the arrival of BusTime will take the guess work out of waiting for some of the city’s least reliable and slowest bus routes around. It’s a solid first step. As the Midtown East rezoning vote nears, there have been a few articles published worth a bit of our attention. In today’s The Times, the City Club of New York takes centerstage as they bemoan the economic machinations behind Mayor Bloomberg’s plan. The long-dormant good government group has issued a 24-page position paper on the rezoning plan, and essentially, they claim that the city’s plan amounts to an effort to sell development rights in the rezoned area for $250 a square foot. The money would go to transit improvements, but none of it, they say, is a constitutionally permissible taking. I’m not well versed enough in New York City property law to pass a judgment one way or another, but the point remains that this group is going after the fund designed to boost transit capacity. If Mayor Bloomberg has his way, one more time, the rezoning and this fee could generate around $500 million for transit investment in the Midtown East area. The Commercial Observer recently ran down the list of improvements, and although it’s one I’ve covered before, it’s worth revisiting. For $465 million — not much less than the cost of the dearly departed 7 line station at 41st St. and 11th Ave. — the list features “widened stairways, additional escalators (leading to and from subway stations at Grand Central, Lexington Avenue at 51st and 53rd Streets and Madison Avenue and 53rd Street), and a pedestrian passage between the Grand Central subway and Long Island Railroad platforms.” Will these upgrades truly solve the capacity crunch and why does this cost so much?